INTERTRADE has an assortment of table top displays to choose from. 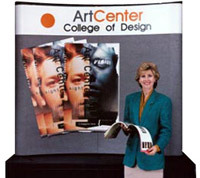 When budget and space limitations exist, table top displays often offer the most cost- effective way to reach prospects. INTERTRADE's table top displays set up in minutes and can pack a powerful punch even when space and money are at a minimum. We offer a variety of colors, surfaces and many other exciting features.